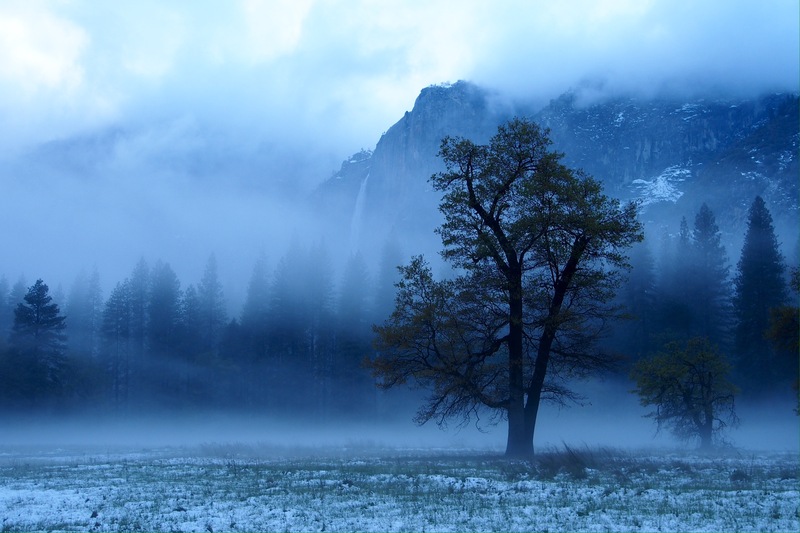 Yosemite Falls rages above a ghostly, snow-dusted meadow on the valley floor. The possibility of injury looms above adventurers of all kinds. Many try to avoid thinking about it. Some take their health for granted. Others hope that constantly expressing gratitude for health will ward off injury… Regardless of one’s mindset, precautionary measures, and preventative training, injuries happens to many (probably most). A day of awesome pow riding at Alpine Meadows was recently interrupted for us when Connor was sidelined with a late season snowboarding injury. The ski patrol crew was incredibly helpful, correctly diagnosing his posterior shoulder dislocation. The emergency room team in Truckee was less awesome, sending him home with a vague “contusion” diagnosis. The good news: we quickly found a great orthepedic specialist in the East Bay. The bad news: it was definitely going to require surgery to reset his shoulder and repair some extensive soft tissue damage. Several weeks of rest and a couple painkillers later, he is now on the road to recovery and is giving it his all. Unfortunately, at least for now, that means complying with a lot of restrictions (e.g., no running, no heavy packs, no climbing, no snowboarding). Since the snow season was wrapping up anyway, I decided to focus more on training for an upcoming trail race while Connor recovered. However, Connor’s drive to push himself, explore, and breathe the mountain air was unaffected by injury. So, we’ve had to come up with more creative ways of adventuring over the last few weeks. 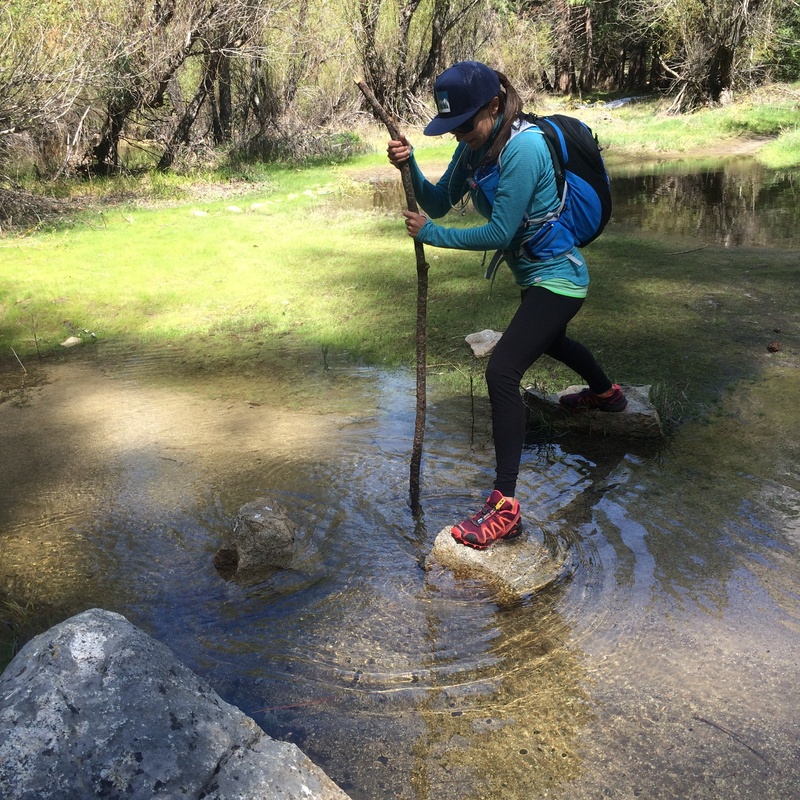 Car camping and day hikes around the Tahoe area have been a great way to scratch the adventure itch since many destinations are still new to us (Skunk Harbor, Paige Meadows, D.L. Bliss State Park to name a few), and last weekend was a particular favorite. We decided to forego a weekend in Tahoe and make the slightly longer drive to Yosemite. With Connor being injured, we thought this might be the perfect time to explore some of the more popular day hiking areas that we usually try to avoid. 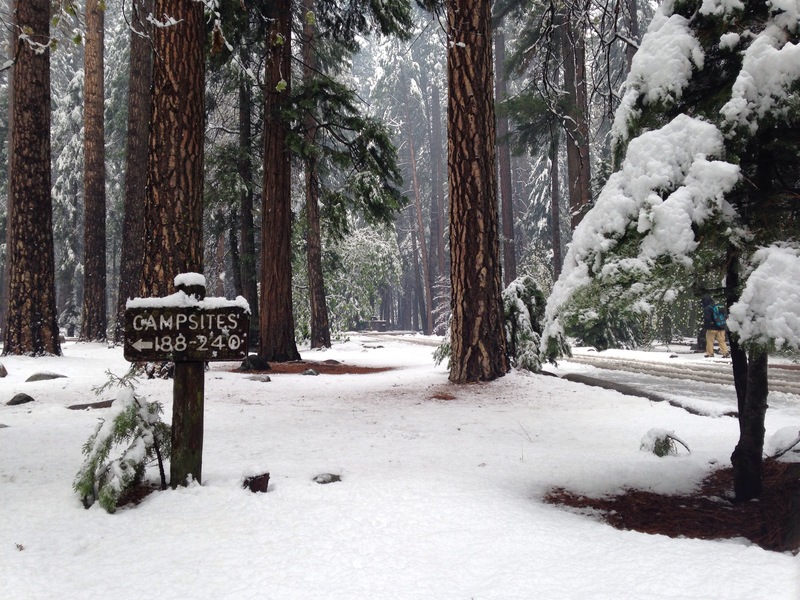 A much needed storm came in on Friday night, and we awoke to about 3″ of snow on the ground in the Upper Pines campground. It continued to snow and then rain all day on Saturday. This worked out incredibly well for us since most people cancelled their reservations or went home, leaving the park shockingly empty for a late April weekend. We embraced our PNW heritage and proudly busted out a tarp and our gortex gear. We wandered the trails on the valley floor, taking in the beauty of a snow dusted Yosemite valley. 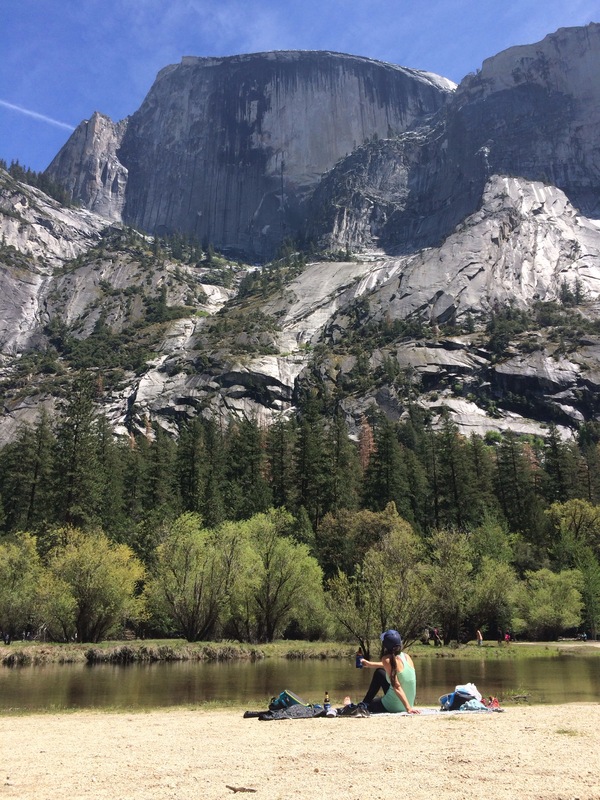 We did the famous Yosemite Falls hike while the falls were raging with water – a rare treat. 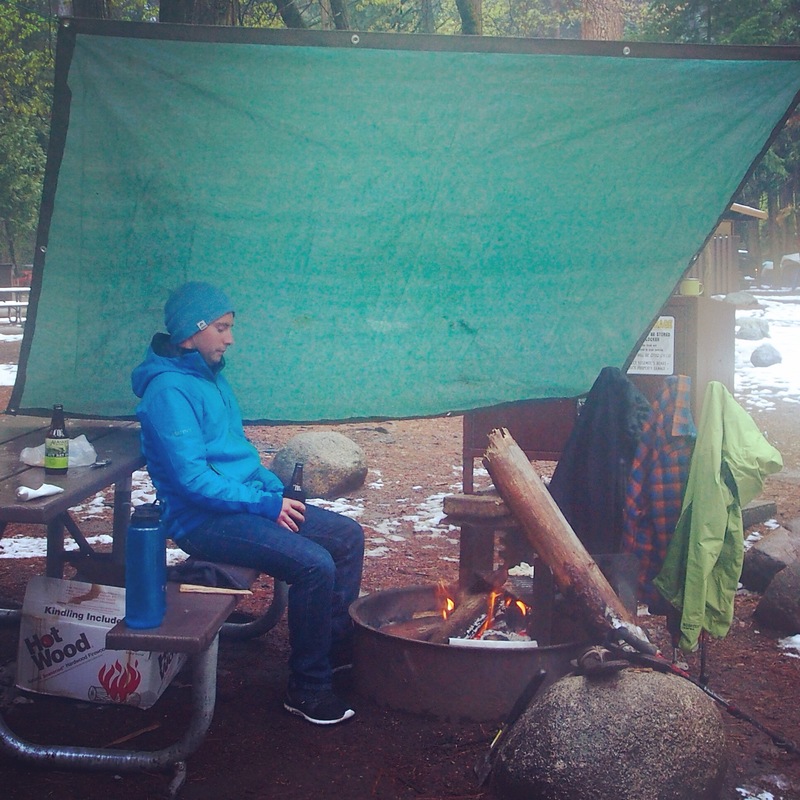 That evening, the snow and rain let up enough for us to dry out most of our gear fireside style. We awoke Saturday morning to several inches of fresh snow and a mostly empty Upper Pines campground. Finally some precipitation for the thirsty trees. 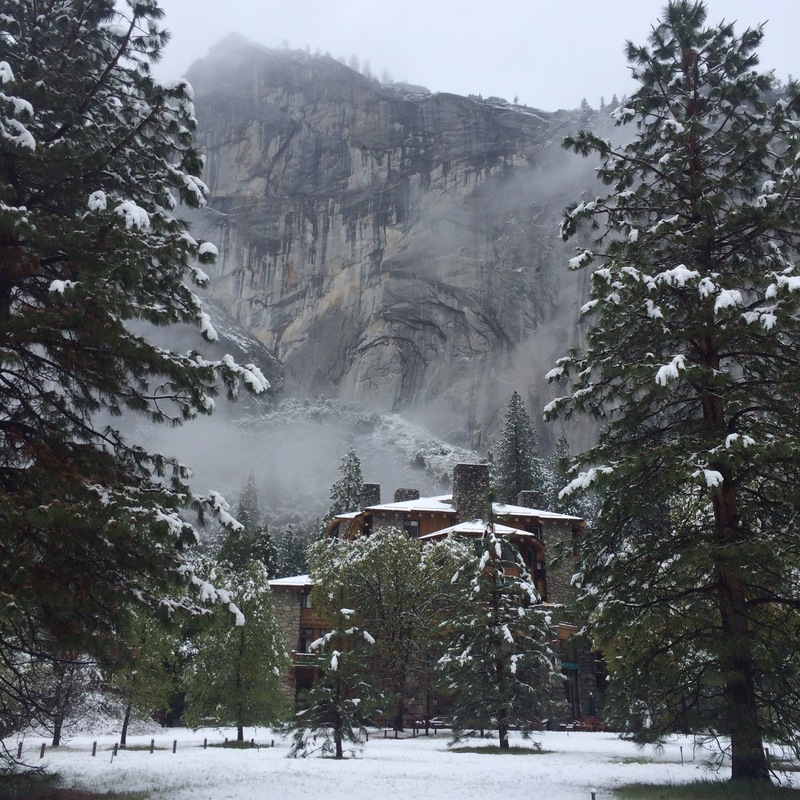 The Ahwahnee Hotel resting in the snow beneath the massive granite. Camping, PNW-style. Tarps, micro-brew, and gear-roasting always included. On Sunday, the typical Cali weather returned and the sun was shining. We decided to check out the Snow Creek trail (looping up past Mirror Lake on the east side and back down on the west side). 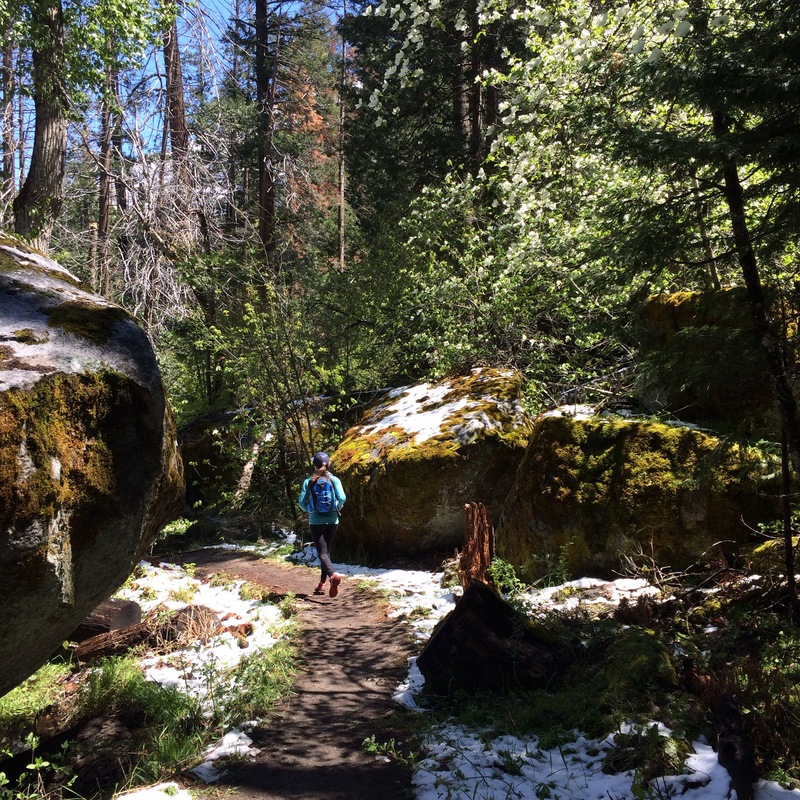 This is also often referred to as the Tenaya Creek Canyon loop trail. I ran the loop and Connor hiked it. Once I finished, I turned around so that I could join him for the tail end of his hike. The complete loop was probably ~6 mi round trip from Upper Pines campground, although I wasn’t actually tracking it. The trail was flat, soft, and meandering, perfect for an easy run. Rock hopping river cross. Never a dull moment in trail running! Especially after a storm. The best kind of trail traffic is the fuzzy kind! Surprisingly, we encountered very few humans on the trail. 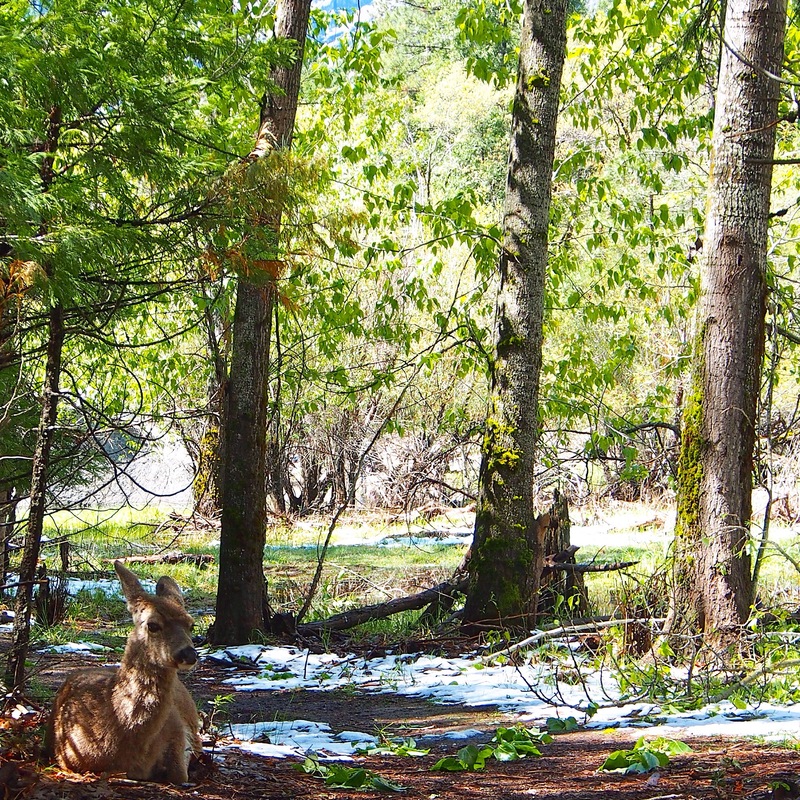 The east side of the trail was full of sun, moss, snow, deer, and glimpses of half-dome. On the first section to Mirror Lake, there is a paved road that many pedestrians take, leaving the nice trail next to the road surprisingly empty. Why they choose that option? No idea. 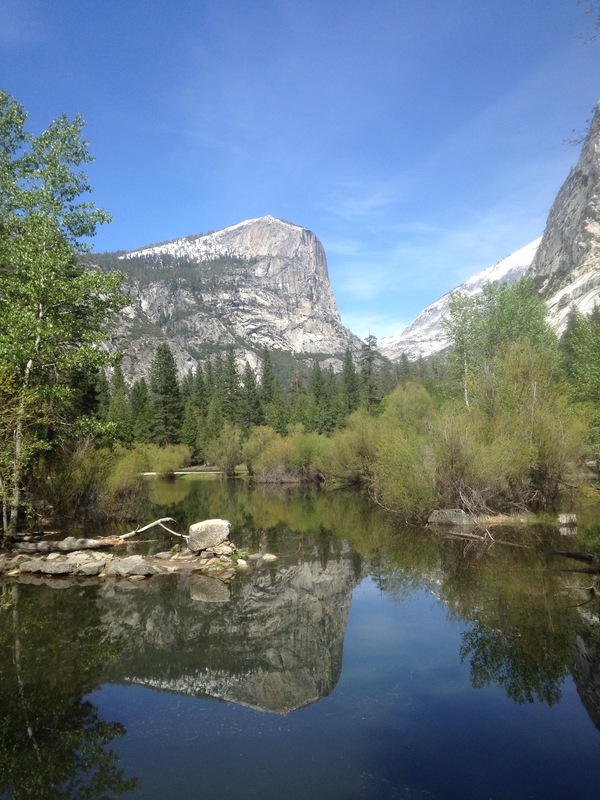 The actual Mirror Lake area itself was fairly crowded, as to be expected on a sunny Sunday for an easy, family-friendly hiking destination in the valley. However, once past the lake, there was hardly anyone on the trail for the rest of the loop. The trail essentially wanders directly underneath Half Dome, offering unique views of the face as well as stunning views of Mt. Watkins, North Dome, Clouds Rest, and Tenaya Canyon. It completely exceeded our expectations! We’ve heard this hike is nothing but a tourist trap and I would definitely disagree. However, be aware that given the snow/rain on Saturday, there were probably fewer people than usual when we hit the trail on Sunday. Mirror Lake doing what it does best: reflecting the stunning Mt. Watkins. Car camping weekends and day hikes don’t give us quite the same rush of big mountain summits or weekends spent backpacking, touring, and climbing in the backcountry. However, Connor’s rehab has given us the opportunity to explore outdoor areas that we normally pass by. It has also allowed us to put energy into some different activities (e.g., drinking beer on the beach… a favorite pastime). While we hope to get back to some more adventurous ambitions soon, time off from our usual routine has lead to surprising and new types of adventure, and we are realizing that injuries and rehab can be a useful time to check in with yourself, revise your goals, refocus your training, and tap in to parts of life that you may tend to neglect.